The classic tale of Little Red Riding Hood gets a re-telling in Li’l Red. Created by WMS, the game is played over 2 sets of reels. There’s a standard 4 row machine as well as a colossal set that stretches some 12 rows high. Look out for stacked wilds that copy from the main to the colossal set as well as a bonus round that awards up to 40 free spins with expanding wilds. Play on all devices from 50p to £250 per spin. The design her is typical of a brick and mortar video slot which is just what we’d expect from a WMS-powered game. With grandma’s cottage in the background, you’ll see playing card suit symbols spinning around the reels alongside a bouquet of flowers and a wicker basket, grandma and the woodcutter. The best symbols are the big bad wolf and a definitely non-Disney Little Red Riding Hood. Both of these 2 characters spin in full stacks. Land 5 of Red Riding Hood and you’ll pocket an award of 5 times your total bet. There’s also a wild. Land a full, 4-high stack of these on the main machine and they’ll duplicate onto the equivalent position on the colossal reels. Li’l Red comes with a Free Games Bonus feature – this is triggered by landing 3 or more of the feature symbol on reels 1, 3 and 5 of either set of reels on a single spin. You’ll then receive 8, 12 or 20 free spins as well as a payout equal to 2, 5 or 20 times your bet. Hope to see plenty of wilds during the feature – every time 1 hits on the main reel set, it expands to fill the whole of that reel. It then copies into the same position on the colossal reels set. Land 3 feature scatters across both reel sets and you’ll re-trigger another round of free spins. 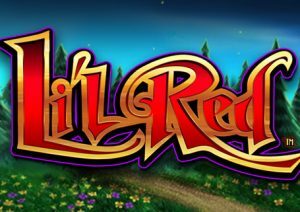 At first glance, Li’l Red looks like a complicated game. The colossal reels make it look much more complex than it really is. In fact, it’s all very straightforward. The fairy tale theme isn’t one of our favourites and the limited range of extras on offer in Li’l Red didn’t do quite enough to win us round. It offers you top payouts of 1,000 times your bet on each spin/free spin – I would much rather play WMS’ Forbidden Dragons which is virtually the same but offers 5x multipliers in the feature for potential wins of 2,500 times your bet on each free spin.